Here's a funky and piglicious twist on pralines. You'll see these appear in a supporting role in my upcoming Pig Candy Praline Ice Cream recipe, so I thought I'd share this recipe first as a bit of a teaser. I'm mean like that. This is a very simple recipe. I just winged it and didn't use a candy thermometer. It's pretty hard to mess this up. Heat the bacon drippings in a large non-stick skillet over medium heat. Add the remaining ingredients and cook until the sugar melts and comes just to a gentle boil, stirring constantly. Cook three minutes more, continuing to stir constantly. Remove the pan from the heat and let the nuts cool in the pan, stirring occasionally. 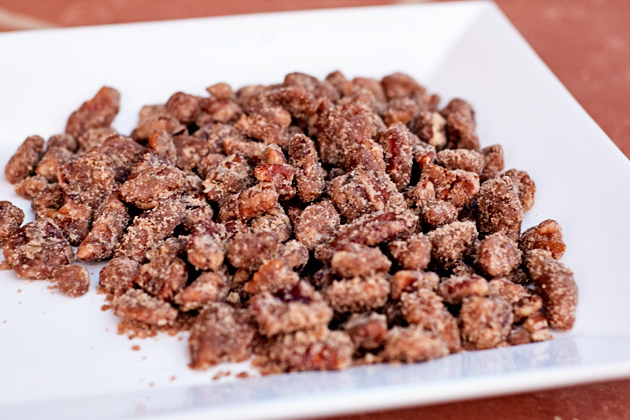 Note: If the pecans are still sticky after they've cooled a bit, just toss them with a little more brown sugar. well, I love sugared pecans and this looks yummy! But, I think the name should be changed... hee, hee... Pig Pralines? Sounds great; will need to try this. I foresee "Pig Praline Ice Cream" coming up soon! Watch out Ben & Jerry's.